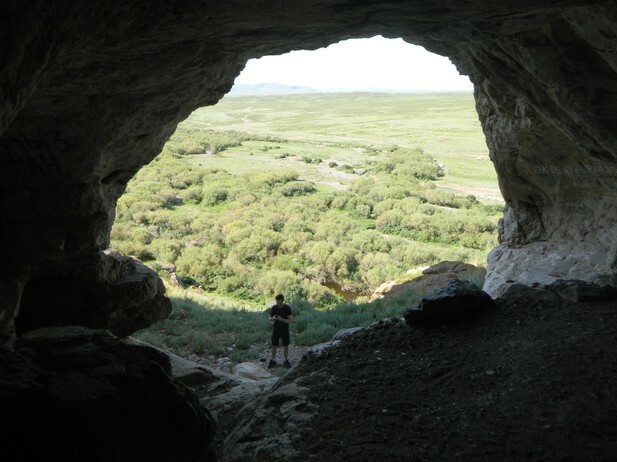 Zach Cofran's career as a paleoanthropologist has taken him from the United States to Kazakhstan and South Africa, where he was part of the team that discovered the new hominin species, Homo naledi. He has just started a new job as an Assistant Professor of Anthropology at Vassar College, New York. Zach Cofran on a field excursion to Shyngystau, East Kazakhstan. Image credit: Gabriel McGuire. What first inspired you to study anthropology? As a teenage nerd I was interested in Classical civilization – ancient Greece and Rome. Studying that in college, I became intrigued by the older, more mysterious Minoan civilization. That got me interested in archaeology, which in the US is part of “four-field anthropology” [the other three fields being biological, cultural and linguistic anthropology]. Once I started studying archaeology I found myself focusing on more and more ancient things, eventually moving into paleoanthropology. How did you choose the topic of your PhD (Mandibular growth in Australopithecus robustus)? Once I got to graduate school to study paleoanthropology, my interests shifted to growth and development. Growth is really hard to study in the past, though, because fossil samples tend to be small and fragmentary. Fortunately, A. robustus, an extinct human relative that lived in South Africa between 1-2 million years ago, has a relatively complete sample of mandibles (lower jaws) spanning from infancy to adulthood. What was the main result of your PhD? I devised a way to statistically compare age-related size and shape variation in the A. robustus lower jawbones with a larger sample of humans. This study showed that each species grew differently in late infancy/childhood, and that A. robustus had an earlier “growth spurt” than humans. Looking back, what do you value most about your PhD experience? What I liked most about doing a PhD was that I got to study lots of different things in different fields. The University of Michigan has lots of tremendous programs that allowed me to get rigorous and varied training for studying human evolution. My advisors, Milford Wolpoff and Laura MacLatchy, were also very supportive and encouraged me to focus on the things that interested me the most. How did you get the opportunity to move to Nazarbayev University after your PhD? What were your responsibilities at Nazarbeyev University? As an assistant professor, I got to develop and teach my own classes, advise students, do research and do departmental and university-wide service. It was a pretty good gig. Did working for such a new institution present any unexpected challenges? One of the hardest things that I naïvely didn’t expect was that I was helping establish the Anthropology Department. Students had little-to-no previous exposure to four-field Anthropology; most were interested in Economics and Political Science. However, once they realized what the field included, such as primate behaviour and biological/social aspects of human variation, many students became pretty interested in Anthropology. What did you enjoy most about living and working in Kazakhstan? Kazakhstan was amazing because it wasn’t really on my radar at all until I got the job at Nazarbeyev University. I didn’t know what to expect going out there. I ended up meeting lots of great friends and colleagues, and seeing lots of amazing things that many people haven’t even heard of, like Torysh (valley of giant stone balls) in Mangystau (West Kazakhstan). How did you get involved in the Homo naledi project? I reeeeeeeeally wanted to participate in the Rising Star excavation itself, but I didn’t apply because it took place in the middle of the Fall semester. So when Lee Berger posted a call for applications to analyse material I jumped at the chance. I’ve been working on South African fossils on-and-off since 2009 so I was keen to return. What was your contribution to the discovery? Because my expertise focuses on a concept (growth and development) rather than a specific skeletal element, I got to spend a little time with all of the fossils. While working on Rising Star, I first helped people decide whether certain elements were adult – the developing teeth and bones of non-adults often have very characteristic appearances. Later, I divided my time between describing the juvenile pelvic remains and helping determine likely associations between isolated teeth to allow us to figure out roughly how many individuals are represented in the recovered sample. I’m currently writing up an assessment of tooth development in Homo naledi, which can shed light on the pace of life in this weird, extinct species. What was your most exciting moment on the project? Probably the most exciting moment was when they first let us into “the vault” where the fossils were stored, and let us freely pore over all the different pieces. It was amazing to see the sheer volume of old bones – it’s matched by probably nothing except the Archaeological Site of Atapuerca (in Spain). And on top of that, from my first glimpses of the material, it was clear to me that this was a unique, probably unknown hominin. Those thumb bones especially stood out to me. And the excitement continued for weeks because there really was just so much stuff and so many new things to see all the time. Did any aspects take you outside of your comfort zone? Probably one of the biggest challenges was working with so many people. All the collaborators I spent time with were great, but sometimes it did seem like there were more people than fossils. What, to you, is the most important impact that the work on Homo naledi has had on anthropology? The discovery of a new species is always important, but I’d say the biggest thing about the Homo naledi discovery is that quality 3D surface scans – that can be printed – are available to anyone (well, anyone with a computer and access to a 3D printer). And they were made public so soon after the discovery. This makes it easy for specialists and sceptics to study the bones without going all the way to South Africa; it makes it easier for teachers to show students real evidence for human evolution; it makes anthropological material readily accessible by anyone. And what was the biggest benefit that it had for you? This project got me involved with lots of different researchers, and on many varied projects. I have a limited attention span so I like being able to work on different things with different people. I’m interested in all kinds of things so my projects may seem a bit scatterbrain. The main things right now are tooth development in humans and fossil hominins, and brain growth in hominins and apes. I’m also in the early stages of surveying for human fossil sites in Kazakhstan. Why have you just moved from Nazarbeyev University to Vassar College? Part of it was that it’s hard to be as far away from family as I was in Kazakhstan. The other part is that Vassar is a great school, with a strong commitment to making education available to all regardless of financial background. Probably my advisor, Milford Wolpoff. He really taught me the value of hypothesis testing and a healthy dose of scepticism. What are the best pieces of career advice you’ve been given? Tied for best are, “Everything takes three times longer than you think” (Milford Wolpoff), and “If you can program, you can ask any research question” (Philip Gingerich, paraphrased). In your opinion, what single change would most improve the way that anthropology is done today? That’s a tough question because, as I mentioned before, anthropology contains four very different subfields. Sometimes it’s easy to lose sight of our field’s diverse origins, so an earnest movement to better integrate these four subfields would probably benefit anthropology as a whole. And what activity do you think would most improve the professional lives of early-career anthropologists? Public outreach of some kind – anything that spreads their work beyond other anthropologists and academia in general. It’s important for lay audiences to know all the kinds of knowledge and approaches to the world that are out there. It can also help individual anthropologists make sure they can communicate complex ideas in understandable ways in papers and grant applications. Do you find it easy getting the work-life balance right? It’s gotten easier with time but it can still be a challenge. Accepting that I don’t have to be working all the time, and that it’s important to relax sometimes was a big game-changer toward the end of graduate school. Still, it can be hard not to feel guilty sometimes if I get a full night’s sleep or don’t work on a Saturday. Run outdoors and visit microbreweries. Digging up and analysing Denisovan fossils in the Kazakh Altai Mountains. One of my all-time favorite movies is When Harry Met Sally. What is the best anthropology joke you know? What do you call a Middle Miocene ape that doesn’t belong to you? Nacholapithecus.